Welcome to the home page of the Swansea and District Table Tennis League (STTL). As might be expected from our name, the League covers all of the Swansea area but also extends from Port Talbot in the east to Llanelli and Carmarthen in the west and Neath and Resolven in the north. The League is formed by a group of local Clubs joining together to play each other in organised competition. It was never in doubt that Penlan 'A' would win the Premier Division for the 2nd year in a row; the only doubt was by how much. 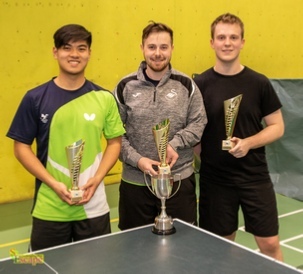 However, they treated Carmarthen 'C' to a spectacular show of power by beating them 30-0; Marc Castro, Jarret Zhang and Josh Morgan all winning 9-0. The closest Carmarthen 'C' came to any points was in the doubles with Tim Evans and Stan Eastwood coming close in the first leg 14-16 and second leg 9-11. After that it was a 'down-hill battle' for them. Second place Penlan 'C' met bottom of the table Cam Gears 'B' and beat them 29-7; Ben Mora scoring 9-0 and Jacob Young 9-1 for the winners. Cam Gears 'B' are confirmed as returning to the First Division for next season. Betws 'A' are confirmed in third place after beating Cam Gears 'A' 22-19 despite Morgan Siddley gaining 8 points for the losers. Kevin Gertsen won 9-3 and Cath Jones won 9-4 for the winners in a close fought match. Penlan 'B', now in 4th place met Penlan 'D' who were in a relegation spot last week but are now in 10th place. Penlan 'B' took the game 26-8 with Lara Whitton winning her matches 9-0. Best for Penlan 'D' was Grace Clements who took 5 points for her side in a hard-fought match as they sought to gain as many points as possible because Carmarthen 'C' still have a game in hand (see above). Carmarthen 'C' must now gain at least 6 points in their match win Cam Gears 'A' to avoid the second relegation spot in the Division. Carmarthen 'B' came 5th in the Division with their win over a weekend Penyrheol 'A'; Carmarthen 'B' winning 28-7 with Regina Grech winning 9-0 for her team. Carmarthen 'B' are claiming the 'A' team name qualifier must now be theirs for next season! Carmarthen 'A' came 6th in the Division beating Penlan 'E' 29-8 with Ben Packer-Jones winning 9-0, David Lloyd 9-2 and Micky Marsh 9-3. The only blip in Carmarthen 'A's score-line was when Jake Colman and Cameron Avris beat Ben Packer-Jones and Simon Packer 3-2. For the losers Cameron was their best on the night. Penlan A narrowly beat Penlan J (+14 start) in an exciting and close run match on Friday night. Steve Homes won 6-1 overall his matches for the losers which caused major upsets in the Penlan ‘A’ side. Going in to the final ‘official’ game of the evening the score stood at 10-10 which meant that there was all to play for, for both Josh Jenkins and Cai Llewellyn. Cai took the first leg, making some remarkable smashes against Josh. Josh took the second leg, just holding Cai off with a 20-20 score-line before taking the leg 23-21. In the final leg of the night the sore crept inextricably towards 21 with Josh, just, getting there first. Congratulations to all the players, playing their part in an exciting final and a must watch game. Port Talbot Table Tennis Club, previously known as TATA Port Talbot Sports and Social Club, has lost its home. Following some changes to the venue table tennis cannot currently be played in the Social Club. All Teams are currently seeking venues to be able to complete their home matches (away matches should remain as per the handbook. Any Teams with ‘away’ matches to be played at Port Talbot should, urgently, contact the Team Secretary to agree rearrangement details. We are sad to report the death of Roy Towell, Club Leader of Penlan Table Tennis Club, Penlan, Swansea. Roy had suffered ill health for some time and he will be sadly missed by all League Players. Our condolences go to all his surviving family. His funeral is on Tuesday 19th February at 11:30am, at Morriston Crematorium. Following the sad death of Betty Gray last year it was necessary to open her post as President of the Swansea and District Table Tennis League to nominations for her replacement. We are pleased to announce that Dennis Bromage has been nominated and accepted as our new President. Congratulations to Dennis and thank you to all our members who participated in this process. Final Matches of 2018 - Roll on 2019. With the last of the matches played in 2018, I am sure we are all looking forward to the Christmas Break. So just a quick Merry Christmas or Happy Holiday to you all and a very Happy New Year for 2019. Chairman, Swansea & District Table Tennis League. Memorial Cup Round 2 Draw now available. The draw for the 2nd Round of the Memorial Cup can be found on our Competitions page. TATA Port Talbot have succeeded in raising a new team to go into Division 2 raising its overall number of Teams to 10. All the new details and other amendments have been added to the Handbook and to its offshoot the Fixtures pdf and are available on the ‘Competitions’ page. The Handbook and Divisional List is now available on the ‘Competitions Page’. The Handbooks will be issued to Team Secretary’s on Monday 24th September 2018 at their meeting at the Dockers Club in Swansea. Team Secretaries/Captains should be present to collect their 2018/19 Handbooks. It is with sadness that I report the death of our President and Penlan Community Club Leader, Betty Gray. She died at Singleton Hospital, Swansea after a short illness. Betty was well known and loved throughout the world of Table Tennis and will be missed by all. At the time of writing the details of her funeral are unknown but I hope to add these as they become apparent. The ‘League’ has now finished (bar a few outstanding matches. It will resume again in October 2018. Now is an ideal time to join a Club and get yourself into a Team ready for the new Season. Teams/Clubs will have to enter their Team(s) before the 31st July 2018 but Players can be added after this date. If you are looking to join a Club or Team then visit the ‘Clubs’ page and contact one of the Club Leaders. The date for the 2018 Annual General Meeting has been set for Monday 11th June 2018 t 7:30pm, Dockers Club, St. Thomas. Swansea. SA1 8BT. A representative from each Team in the League is required to attend. The results of the Swansea Closed Competition 2018 are now available and can be found on the Results page of this site.. The date for the 2018 Swansea Closed has changed and all competitions are now all on Saturday 28th April 2018. The Swansea Closed 2018 will now be held only on SATURDAY 28th April. The hard back event has unfortunately been cancelled. Entry fees will be refunded at the tournament. The under 11 event is also cancelled and the under 13 event will be played at 10.30am. The cadets, juniors and junior doubles will be played later in the day as players are available. Apologies for any inconvenience or disappointment that this has caused. 10th March 2018 - Semi Final of the Memorial Cup Results are now available. The last 2 Teams are in the Final…. The Semi Final Results of the Memorial Cup is available here. The last two teams - Cam Gears D and Penyrheol D - will play on a date to be decided. The 3rd Round Draw has been made and is available here. We are down to the last 8 (Quarter Finals) with 3 teams from Cam Gears, 2 teams for Penlan and 2 from Penyrheol and 1 from TATA Port Talbot. Good Luck to all. November 2017 - Could you be playing in Germany? Lara Whitton and Grace Clement have returned from China after an exciting and hard working stay. Lara reports that “China was unbelievable!!! We trained for 10days, 3sessions a day. The first session would be 9:30 until 12:00 then 2:30 until 5:00. We had multi ball everyday and then we would train with the Chinese practice partners for another session. It was hard getting used to the food that they ate because it was very repetitive. Every day the courses would be served with plain sticky rice and another meaty dish. We never really knew what we were eating because none of the waiters could speak much English. Some people would come across rude but some others were very kind. The roads were hectic and the traffic lights would turn red but motorbikes would still be buzzing past you! It was an incredible place and I have never seen such a developed country. There were two sides to the country there were rich people and poor people. There was a big difference between the two. The markets were busy and the Chinese would take every chance they got to make you buy something. We saw the centre of Shanghai and took lots of photos of the Pearl Tower. Overall I had an amazing time training a once in a life time experience I’ll never forget!!! Alex Straub is looking to forge a relationship with the Swansea League when he goes back to Germany. Alex currently plays for Cam Gears and is keen to forge good relationships between his Cub/League in Germany and our League in Wales. He has prepared a flyer which can can be found on the ‘Competitions’ page of this website. Why not have a read and see if you can go over to Germany in the near future. The 2nd Round Draw for the Memorial Knockout Cup Competition has been drawn and published. You can find it on the ‘Competitions’ Menu. The 1st Round Draw for the Memorial Knockout Cup Competition has been drawn and published. You can find it on the ‘Competitions’ Menu. The League Season has started and Teams in all Divisions have been playing since Monday 9th October 2017. Early results show a win for new team Carmarthen F putting them at the top of Division 2 - not for long maybe! 2017/18 League to Start 2nd week of October 2017. The new League Season will commence the second week of October 2017 - week commencing Monday 10th October. The League Fixtures will be given out at the Secretaries Meeting to take place on Monday 25th September 2017 at the Dockers Club, St. Thomas, Swansea. Early views of the Divisions can be seen here. The League’s AGM was held on the 26th June 2017. There were no changes to the Rules and all Officers and Committee Members were re-elected by those present. Penlan P win Tudor Jones/Team of Three title. All matches in the Handicap Competition and the League have now been concluded and we welcome the opportunity to pit our wits and skills against our fellow players again in October 2017. The Swansea Table Tennis League will be held on Monday the 26th June 2017 at the Dockers Club. 7:30pm start. Carmarthen ‘E’ win the Division 1 title. Carmarthen ‘E’ have secured the Division 1 Tile with an 48 point margin. Second place Jerusalem Baptist Church will now be promoted to the Premier Division along with Carmarthen ’E’. Port Talbot ‘A’ missed out on promotion by 20 points regardless of a late flurry. At the bottom of the 1st Division Port Talbot ’B’ have been relegated to the 2nd Division along with Penlan ‘H’. Both teams still have to play each other but even if Penlan ‘H’ gained 30 points they still cannot catch Penyrheol ‘C’ who are in number 10 place in the Division. Currently, Jerusalem Baptist Church are in 1st place with 483 points. However, they have finished all their matches and Carmarthen ‘E’ (481 points) are only 2 points behind them with 2 matches still to play. It seems inevitable that Carmarthen E will therefore win the title race but you know what they say about counting ‘chickens’. The third place is also still up for grabs as Betws Ruby Club ‘B’ are in third spot with 416 points and, they too, have played all their games. Carmarthen ‘D’ are in fourth place but again have two matches still to play, and, with 396 points they only need 21 points from 2 matches to lay claim to the third spot. At the bottom of Division 1 its too close to call for the eventual teams that will be relegated. Both Penlan ‘H’ and TATA Port Talbot ‘B’ are in the bottom places (11 and 12 respectively). However, both have games in hand and could make a fight of it with Penlan ‘G’ who are third from bottom. In the Second Division Penyrheol D have won the tile. They cannot be caught by Penlan ‘L’ who will take 2nd place. Carmarthen ‘F; are currently in 5th place but have 4 games yet to play. Penlan ‘K’ are currently in 3rd spot and could ‘arithmetically’ just be piped at the 3rd post by Carmarthen ‘F’. However, that would mean Carmarthen ‘F’ having to take 30 points from each of their remaining matches and realistically Penlan ‘K’ will maintain their 3rd place. But …….. Let’s wait and see. Penlan C win Premier title. Penlan C has won the title for Season 2016/17. There is still one match left for Penlan A who are in 2nd place, but even if the gain 30 points from that match they cannot catch Penlan C. Carmarthen A have come 3rd. Full results on the Results page of this site. The Swansea Closed took place on the 17th and 18th March 2016. It was, as usual, an exciting event with all players playing their best in order to reach, and win, if possible, their respective Finals. Marc Castro had a good competition winning the Men’s Singles; the Men’s Doubles (in partnership with Tommy Hayden); the Mixed Doubles (in partnership with Lydia John); the Junior Singles and the Junior Doubles (in partnership with Jacob Young). The Draw for the Swansea Closed is now available on the Competitions page of this site. The entry form for the Swansea Closed Competition (17th and 18th March 2017) is now available on the Competitions page of this site. It is with sadness that I report the death of David James. David was a long time member of the Swansea League and played with Mary Wilkins and Gaynor Griffiths in a team based at Dillwyn Llewellyn club. Dillwyn Llewellyn is no longer a table tennis venue and the members have joined other clubs including Penyrheol but David had stopped playing to care for his wife. I understand David had a sudden heart attack which caused his demise. Our condolences go to David’s wife and Family. League competition has now finished for 2016 with a break for Christmas and the New Year. The League will resume on week commencing Monday 2nd January 2017. May we wish all of you a very merry Christmas and a happy and prosperous New Year. The date of the 2017 Swansea Closed Table Tennis competition has been announced. The Competition will be on Friday 17th March and Saturday 18th March 2017. It is to be held at Morriston Leisure Centre, Swansea. Entry forms will be issued closer to the date and will be available on this site via the ‘Competitions’ page. The 2nd round draw for the handicapped tournament has been drawn and is available on the Competitions page of this site. The 1st round draw for the handicapped tournament has been drawn and is available on the Competitions page of this site. This week has seen the start of the 2016/17 Season with all Clubs participating in their first matches. The season will have a natural break for Christmas for weeks commencing Mondays 20th and 27th December 2016. All Handbooks have been handed out to Team Captains. Have you got yours? An updated copy is available on the ‘Competitions’ menu tab. The 2016/17 Handbook is now available on the Competitions tab. A ‘Fixture List’ as been extracted to make your life easier in determining who you will be playing and when. Also extracted is a separate copy of the Constitution and Rules as updated by the AGM of June 2016. A lively debate ensued at the Annual General Meeting where numerous proposals to change the ‘League Rules’ had been proposed. Those proposals by Doug Smith of Cam Gears were either defeated or withdrawn following a promise by the Chairman that proposals would be placed before the next AGM to ‘regularise’ the Management Committee’s current stance on teams gaining promotion having to play in the higher division for a minimum of one season. The proposal to amend the Rules to allow the Chairman to constitute the Disciplinary Committee and/or Appeals Committee was accepted unanimously. This was simply to ‘clean up’ Rules which did not ‘scan’ correctly. 1) to clarify and strengthen the rule on ‘playing up’. Players are now restricted to playing a maximum up for 5 matches for a Team in a higher Division or of 10 matches for playing for multiple Teams in a Higher Division. 2) to clarify and strengthen the rule around the cancellation of Matches. Teams must not only get authority for the cancellation they must also have agreed a replacement date prior to getting authority to cancel from the Divisional Representative. Additionally, failure to follow the rule may now result in a loss (fine) of points for their failure to follow the new procedure. Carmarthen ‘F’ have taken the Division 2 title with a total of 511 points, 38 more than their nearest rivals Penlan ‘L’ who take second spot. The last Carmarthen ‘F’ match was against Penlan ‘H’ who were looking for 20 points to be sure of second spot but with only 16 they loose out by just 4 points (3 for a draw for second spot) and have ended up in third spot. Ryan Trigg from Carmarthen ‘F’ also takes the top spot in the Divisional Averages. Penlan ‘F’ take the Division 1 title. Penlan ‘F’ took first spot ion the First Division with a game to spare. The team of Tony Holt, Sammi Jabber and Colin Towell are looking forward to promotion to the Premier Division for season 2016/17. The title race for Division 2 is still ongoing. I am sad to report that news has come through stating that Anthony died suddenly either late yesterday or early this morning. I have no further information at this time but I will update this items as I receive more information. It is our sad duty to report the death of Jeff Parsons, a long standing member of our Club and a long standing League player. Full report here. Our sympathies are extended to Janice and their children. Jeff’s funeral will be held at 10:30am on Friday 22nd April 2016. The service will be at the Greenfield Chapel, which is on the corner of Murray Street (opposite corner to the Llanelli cinema) at the junction of the A4214 and B4304; at 10:30am. Jeff will be buried at 11:30am at the Llanelli District Cemetery (also known as the “Box Cemetery”). Teams in Division 1 and Division 2 are moving towards the last week of the 2015/16 Season. However, some Teams have one, two or multiply rearranged games to go which has made it difficult (in the 2nd Division) to confirm which team will Win and which will be Runner Up. Teams with outstanding matches are urged to get them played within 2 weeks of the end of the season. 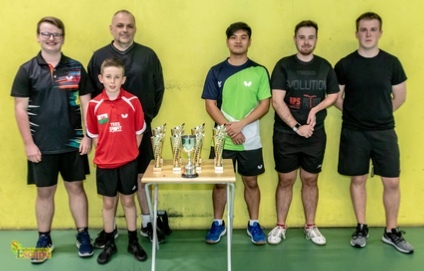 In a tremendous final week, Penlan A retained the Premier Championship by just three points with a 27-4 win over Tata Port Talbot A. Marc Castro becomes Top Player following his 9-0 win and was well supported by Tommy Heydon's 9-1. (The table on the results page shows Dean Cundy as top of the averages but he did not play sufficient games to qualify for the ‘cup’ winners spot). Cam Gears A are runners up with a 25-17 win over Penlan B thanks to Morgan Siddley and Ceri Higgon both winning 9-4. Carmarthen A finished one point behind in third place with a 27-11 win over Carmarthen B. Jason Peckham 9-2 and David Lloyd 9-3 for A.
Betws A have to settle for fourth spot following their 27-7 defeat of Carmarthen D with Catherine Jones 9-0 and Nigel Stopher 9-3. And, as can be seen,here only seven points separated the top four teams in the closest finish for many years. Penyrheol A recorded the biggest win of the week beating Penlan D 28-9 thanks to Dennis Bromage 9-1 and Simon Mitcheson 9-2. Carmarthen C also finished well with a 26-9 win over Penlan C. N Hulme winning 9-1. Tata Port Talbot A and Carmarthen D will be the two teams relegated. The premier Division has finished two weeks earlier than planned because they were able to matches forward on to the ‘cup’ weeks when no Premier Teams were playing. Division 1 and 2 still have 2 weeks to play with a completion date due on the 16th April 2016 (excluding postponed games). The final of the Tudor Jones/Team of Three Handicap Cup will be on the 19th April 2016 and is to be held at Carmarthen Leisure Centre after Carmarthen won the toss of a coin to land a home match (start time 7pm). The final is between Carmarthen ‘E’ and Penlan ‘F’. Table setup will be at 7pm and space will be provided for spectators. The ‘Semi Finals’ draw of the Tudor Jones Cup has been announced. Find the draw on the ‘Competitions’ menu tab. The draw is now available on the ‘Competitions’ menu page of this site. The entry form for the Swansea Table Tennis Championship is now available on the ‘Competitions’ menu tab above. Please return all entries to Mary Wilkins on or before Friday 5th February 2016. The dates for the Swansea Closed Competition (2016) will be 19th and 20th February 2016. Manselton Club pull out of league. Manselton Table Tennis Club have had to pull out of the League. However the residue of the team have combined with Port Talbot players to put in a substitute Team named Port Talbot D. The Secretary of the Team will be Phil Hill who’s details are on the Club/Port Talbot page. The new League Season starts this week. With teams in the final throws of preparation and some matches already played by the time you read this, players are gearing up to challenge and be challenged. The Team of Three final was held on Friday 8th May 2015 at Cam Gears Sports Centre, Resolven, Neath. The finalists were Cam Gears C (Div 1) and Penlan F (Div 1), and following an exciting match Cam Gears came out on top. The Annual General Meeting of the Swansea and District Table League will be held on 22nd June 2015 starting at 7.30pm. The meeting venue will be the Dockers Club, St. Thomas, Swansea. As per Rule 19 of the Constitution, any Teams who wish to put forward a proposal to change the Constitution must do so at least 28 days prior to the AGM. At the formal end to the season Penlan A were on equal points with Penlan B but with a game in hand. Consequently, they had only to gain 1 point form their last (re-arranged) match against Carmarthen A. This match was played on Sunday 19th May at Penlan, Swansea. Penlan A easily beat Carmarthen A and formalised their win. Congratulations to all members of the team. The ‘called for’ Extraordinary General Meeting was held on Monday 13th April 2015. There was only one item on the agenda - that to consider the reinstatement of the Premier League being held on a weekly basis at a central venue. A total of 26 teams (out of a possible 33 teams) were represented at the meeting. As a consequence, the Premier Division will continue to meet weekly at Morriston Leisure Centre for the 2015-16 season onwards - unless there is another change proposed!! We have heard that Betty is making a positive recovery after her bad falls in February. She is not yet up to attending Penlan Club but is on the way to recovery. We have heard that our President, Betty Gray, has had 2 bad falls outside her home. These have caused her to have to receive specialist help from carers. She has not been at the Club for some weeks and Roy Towel has taken the helm for the time being. We wish her all the best and a speedy recovery. 2014/15 League has started with three Divisions/33 teams. More news on the scores can be found under the Results tab. See the full story on the right hand side of this page. Swansea Table Tennis Web site announced. The new website for the Swansea Table tennis League had been build and piloted during the summer 2014. Its existence was announced to the members at the AGM. Club Leaders were asked to contribute text and pictures for their individual pages on the site. Friday night, 9th May, saw the final of the Tudor Jones Cup between Llanelli and Dillwyn Llewelyn 'B' who received a nine point handicap. The match started with Steve Davies of Llanelli beating Mary Wilkins 2-0. Gaynor Griffiths of Dillwyn then took the second game 2-1 followed by Mary Wilkins who put Dillwyn into a slim lead with a 2-0 victory. Gaynor Griffiths further extended Dillwyn's lead with an exciting 2-1 victory over Steve Davies. lead to three games with two matches to play. Llanelli won the next game 2-0 through Steve Davies setting the match up with a last game decider between Derek Summers and Dave James of Dillwyn. Derek took the first game but had to struggle against a dogged Dave before taking the second game 22-20 to secure a narrow 11-10 victory for Llanelli in what was an enjoyable and close fought match. Congratulations to both sides and in particular Gaynor Griffiths of Dillwyn who won 6-3. If you are an individual and would like to play in our League please have a look at the Club page and find one close to you or one that suites your style of play. If you are involved in organising a Club and want your team to join the League please use the Contact page to make contact with us. CLUBS Page of this website. Penal ‘A’ twin the Premier Division with a 31 point margin over rivals Penlan ‘C’.